From Computerized Cutters, Inc., the company that pioneered automated channel letter bending machines over 20 years ago, comes our NEWEST machine designed and fabricated in the U.S.A. that is priced AND sized so even the smallest sign shop can be more profitable selling channel letters. This PORTABLE, TABLE-TOP version of the world-famous Accu-Bend is REVOLUTIONARY. 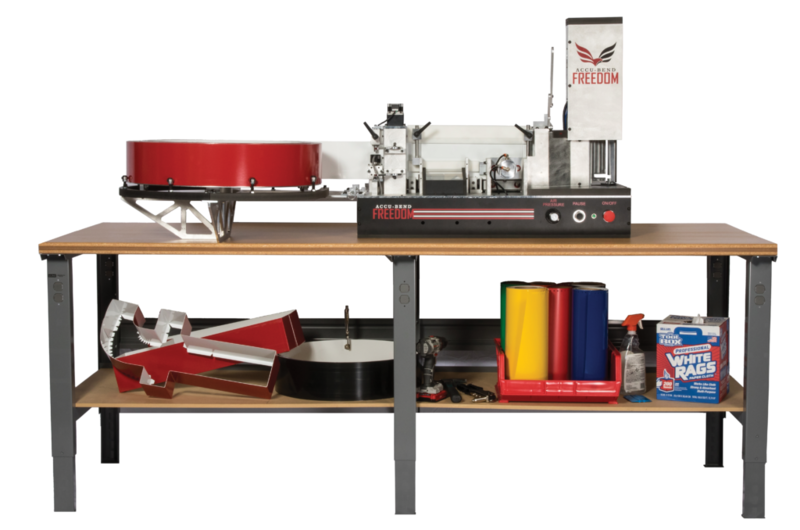 This TABLE-TOP model can do what full-size machines can but in a compact and portable size. For use on a workbench, rolling cart, or shop counter. FREEDOM IS FOR EVERYONE! Whether you purchase letters from a wholesaler, produce channel letters now and want to add production capacity, or are just entering the channel letter segment, the space-saving Accu-Bend FREEDOM is for you! Call 800-310-2887 for brochure and specifications. Since Computerized Cutters, Inc. introduced the world’s first channel letter bending machine in 1997, a few competitors have tried to replicate our game-changing capabilities but come nowhere close to the quality of the Accu-Bend brand. Many leading sign makers and wholesalers around the world rely on Accu-Bend to grow their businesses. Now, the new Accu-Bend FREEDOM makes this market-leading technology available to any size sign shop at an affordable price. Don’t settle for an inferior imitation. You can own a genuine Accu-Bend brand machine. Designed and fabricated in the U.S.A. and backed by the company that created the original, Computerized Cutters, Inc. has always stood behind its products with unparalleled support. Accu-Bend means quality construction that we stand behind. Toll-free customer service and support PLUS a one-year warranty. THIS IS WHAT FREEDOM LOOKS LIKE! Freedom Introduction @ FASTSIGNS 2019 Convention "The coolest thing I've seen..."
Freedom Introduction @ FASTSIGNS 2019 Convention "I've heard a lot about this..."
Freedom Introduction @ FASTSIGNS 2019 Convention "New and HOT on the floor..."
MORE PROFIT PER LETTER. No need to buy wholesale. No more bending letters by hand. SAVE SHOP SPACE. Space-saving table-top model. For use on a workbench, rolling cart, or shop counter. SIMPLE TO USE. No special skills required. Set up and run letters the day it arrives. QUICK TURN-AROUND. Produce channel letters quickly. Complete production control. PRECISION. Consistent and repeatable letters day-in and day-out. ADD PRODUCTION CAPABILITY. Already have a channel letter bender? Add the FREEDOM for increased production. EFFICIENT. Runs on 110V AC power and shop air. Just plug into a standard outlet and go. MADE IN THE U.S.A. Accu-Bend means quality construction that we stand behind. Includes a one-year warranty. Computerized Cutters, Inc. was founded in 1994 on the principle that cutting-edge technology, combined with quality components, make the best tools in the marketplace. All our machines are built to order in-house and engineered to be trouble-free. Our machines feature the highest-quality components available. We are committed to providing high-quality products at the best value for your dollar. For accurate, reliable productivity, Computerized Cutters, Inc. is the one to turn to when your reputation rides on doing the job right. Copyright 2017 Computerized Cutters, Inc.